Imagine going to a foreign country and walking barefoot 90% of your time there. What is the first thing that comes to your mind? Two weeks ago, I went to Myanmar (Burma) and although I have traveled to many different countries around the world, this was my first time going to a third world country. What brought me to Myanmar? My best friend is from there and I decided to pay her a visit. We flew in to Yangon, and then went to Bagan. Bagan is probably one of the most beautiful places I’ve ever been to. In Bagan, there are many pagodas. A pagoda is a tower like structure made of stone, brick or wood, and is used like a temple. In Myanmar, the pagodas are more conical or pyramid shaped. 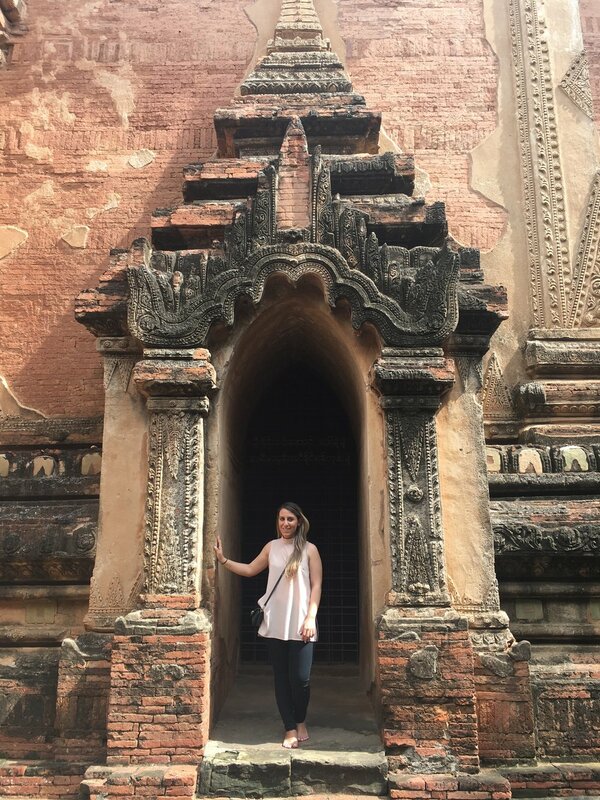 In order to enter the pagodas, you have to take off your shoes and walk barefoot…what an experience that was! Honestly, this was something that I had a hard time with at first because there were so many stray dogs all over the place and we walked on dirt, on stone, on concrete and even over puddles of water, but eventually, I got used to it. I started to focus on the overall experience of being barefoot and being that much closer to my environment, and that’s when I really started to enjoy it. I can still smell the shrimp being sold on the side of the stairs as we went up to one of the pagodas and I can replay the sounds over in my head of the people chanting their prayers in front of the pagoda. It was very hot in Bagan, and some of the pagodas were designed for this weather. I remember walking into my favorite pagoda and the temperature was cold, the ceiling was high, the space was dark…it was perfect. I remember stepping on the brick floor and it was so cold and rich with texture. I felt comfortable and relaxed. My senses were engaged and I enjoyed it very much. On one of our days there, we woke up at 5 am and headed out to a pagoda. We climbed about 20 feet high and watched the hot air balloons over the sunrise. This was one of my favorite experiences. Hearing the sound of the birds as we climb very steep steps to watch the hot air balloons rise with the sun, seeing the excitement in everyone’s sleepy face and just being there surrounded by nature – such a rich experience. What was different about this experience is that not only was I touching with my hands, but also with my feet. Because we were climbing and walking on textured paths, I had to make sure that my feet were grounded so that I wouldn't fall. I felt the temperature change as I walked from material to material and place to place along with the textures and uneven paths. This is an important factor in design and a lot of times designers forget because we are so accustomed to wearing our shoes everywhere. When we wear shoes, we don't notice the transitions in our paths as much as we do when we are barefoot. This is also important for the blind because they have to rely heavily on different paths because thats one of their wayfinding methods. There is so much that our body can tell us, we just have to expose ourselves and become more aware of our body as a whole and not just rely on our eyes and hands.